If you're hoping for birds, this is not the blog post for you. A lot of my recent outings have not led to great sightings bird-wise, but have been cool enough that you might enjoy them anyhow. I'll start with the ice caves. 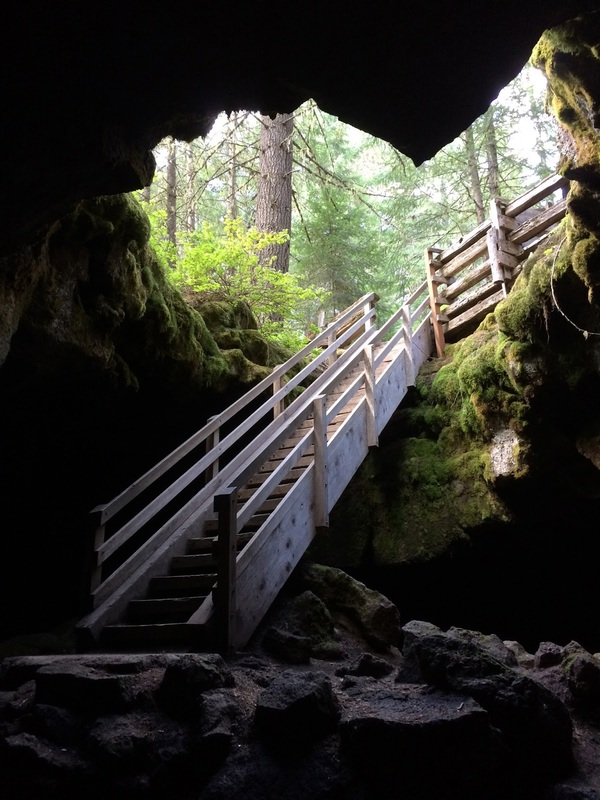 The Trout Lake ice cave is a fascinating spot, easily accessible from a parking area off FS 24, about six miles from Trout Lake, WA. The above staircase leads to the main area of the cave where even in August we found ice. There are a handful of cave entrances in this area, some leading to dead ends, and others making shortish tunnels. All require flashlights or headlamps to navigate. These caves are pretty easy to explore in the summer, but in the winter they get super crazy icy. I hope to return in April to catch a glimpse of the real icy show. Also in the area are trails that lead to natural bridges which were hard to photograph, but trust me, they are cool. And there were huckleberries galore around! Oh, here's something bird-ish for you: I found a pellet in my yard for the first time ever. I broke it apart to investigate but could only identify a small bird beak among the tiny bones. There had been a Cooper's Hawk in my neighbor's yard that morning so perhaps that's who left it? On Saturday my friend and I set out to Clatskanie, Oregon on a sort of kooky mission. As you may recall, I have done some research into the previous owners of my house, Vi and Jim Gale. Vi was a poet, well-known in local circles, and even started her own publishing house. I read an interview with her awhile back where she described the first house she lived in upon moving to the States from Sweden. "If you go to Clatskanie and stand at the end of Nehalem Street, and look across the little creek that is Conyers Creek, there is a little house in the clearing..."
And for no reason in particular, I wanted go to Clatskanie, and stand at the end of Nehalem Street, and see that little house. There it is. On the way to Clatskanie we stopped in Rainier to check out the waterfront. Caspian Terns were fishing alongside gulls, cormorants, Osprey, and a billion people out on boats. A couple of kids came up to us and asked if we wanted to see a sunken boat. Duh. 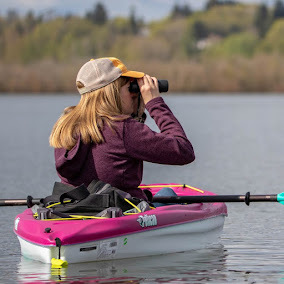 After visiting Rainier and seeing the target house, we headed out for a drive around the different dike roads in Clatskanie, including the ridiculously named Beaver Dike Road. We stopped to check out this busted bridge and some Purple Martins. We tried to figure out what this metal thing was, perhaps an old silo? Ok, one last adventure. On Monday, my friend and I did the short but strenuous hike to Spirit Falls along the Little White Salmon River. Most of the hike involves a vague path straight down a talus slope but eventually you end up in the trees with a most stunning view of the falls. My friend bought an ENO hammock last month and has been trying to find cool places to set it up. This spot qualified. 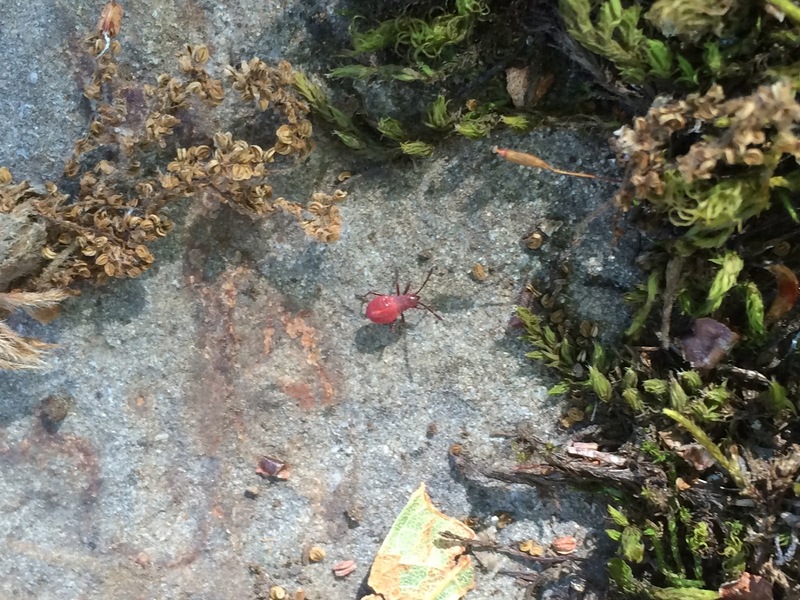 On one of the rocks on the way back up the trail I noticed some little red bugs- any idea what they are? We stopped by the Little White Salmon Fish Hatchery and then crossed the bridge to Hood River for a beer and a tempeh burger at the Full Sail Brewery. After this refueling we checked out Panorama Point for a sweet view of Mount Hood (and Adams in the other direction). 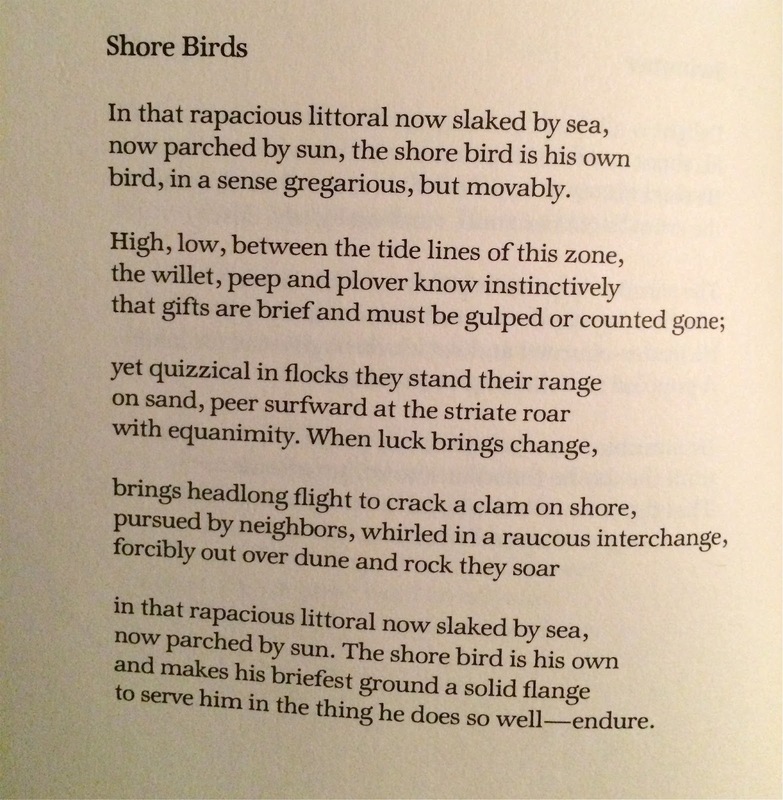 Now that you are all caught up on my adventures, I will leave you with a Vi Gale poem featuring birds, as many of you are probably out and about looking for shorebirds right now. I love the poem! Now I'm ready for the shorebird festival. How cool to know about your house's former inhabitants. It's awesome, though I fear my fascination is borderline creepy. Delightful tour. That water (@ waterfalls) is AMAZING. What a stunning little spot. I think that rusty thing (possible silo) is an old incinerator. They had something EXACTLY like that near Eatonville, WA, and my husband had to look it up. 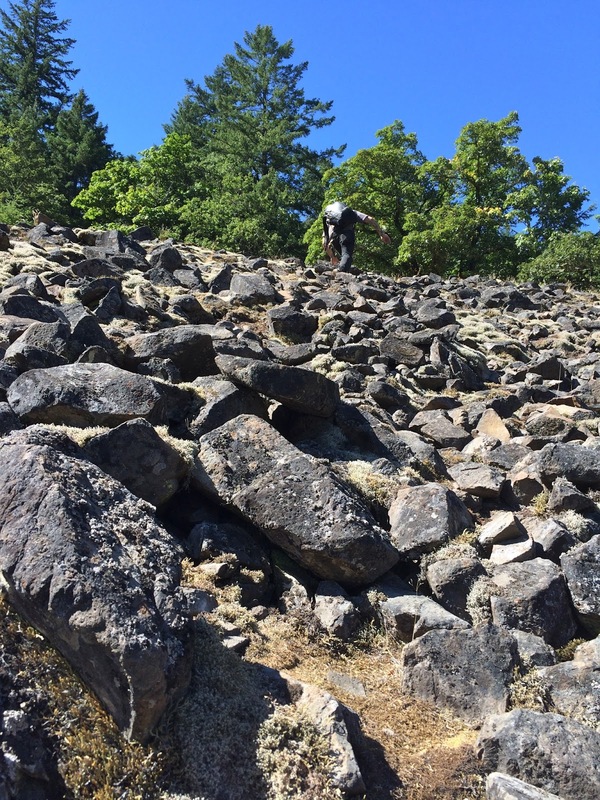 Think it's associated w/former logging activities in the area. I don't know what that little red bug is, but it's SUPER cute & looks like a nymph. That color is amazing. AH! Thank you! So many answers- that spider is definitely some kind of trapdoor spider (or false trapdoor). AND that rusty thing is definitely an incinerator! The logging industry was huge in Clatskanie- Vi Gale's father worked at a local logging camp when they first moved there. Very cool! Nice stalking Jen, and also these other adventures seem pretty full of pulchritudes and coolness. I take it you're also a big fan of that James Caan/Kathy Bates movie Misery??? The incinerator is pretty sweet, if somewhat non-aesthetic, and would be good to know about if ever disposing of evidence in the area. That spider looks like some kind of Ummidia genus Trapdoor. My favorite though is definitely Beaver Dike Road; it sounds like a cool place. If living in the area, I would go there to smoke cigarettes and try to pick up chicks...though on second thought it might be very, very unsuccessful. So many good adventures that just highlight how boring my life is. I will live vicariously (within WA county). All these adventures what fun!! Love the cottage your former house owner lived in, awesome its still there!